The NeuroSuit™ creates a breathable, soft dynamic orthotic or sometimes referred to as adaptive clothing. It is made of a vest, shorts, knee and elbow pads, gloves, shoe attachments and a hat if necessary. All these pieces are interlocked by bungee type chords. These chords assist with proper alignment of the body and essentially frame the body from the outside (external skeleton). The best part of the NeuroSuit is that simultaneously to assisting the patient's body to be in correct alignment, the bungee chords provide a comforting compression to the joints and distribute a vertical weight bearing to the patient's entire body. This sends strong messages to and from the brain and central nervous system bringing about an instantaneous increase in body awareness which leads to improved motor planning. All the while the patient has to work against the effects of additional gravity being placed upon them from the weight-bearing component of the bungees. They build muscle at a faster pace and the skills they are learning are amplified to the central nervous system. The result is faster results towards goals of improved motor skills from performing specific exercise and functional activities while in the NeuroSuit which is carried over into daily life even when not in the NeuroSuit. 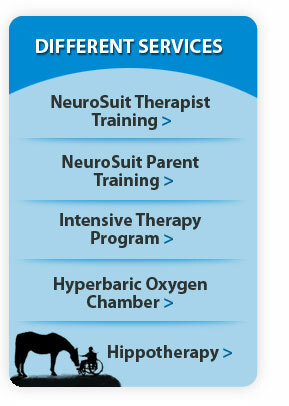 NeuroSuit offers training for therapist and parents/caregivers. Contact us for more details regarding courses for working with children or adults. We also offer courses for therapist utilizing intensive methods in your practice without the NeuroSuit. Learn how to give your patients an intensive boost.